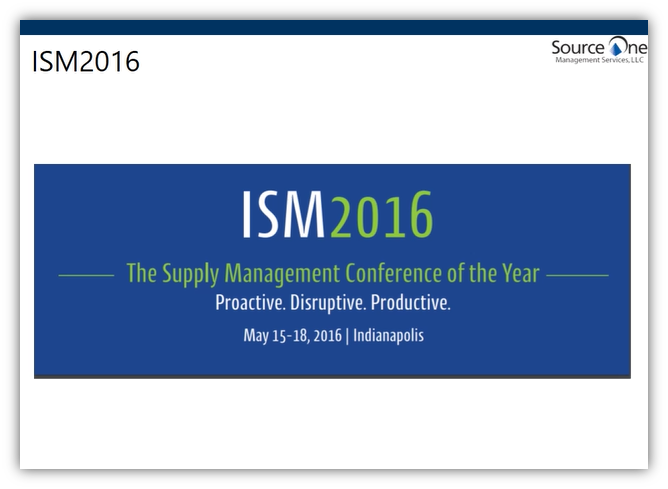 The Countdown to ISM2016 continues and this week we're joined by MRA Global Sourcing Managing Partner Naseem Malik. Malik, co-chair of the conference's People Track gives us as inside look at the conference schedule and what participants can look forward to at the event this year. With ISM2016 taking place in Indianapolis, sessions are all Indy 500 themed and designed for attendees at all stages in their career. Malik shares how the track is different this year, listening to attendee feedback and providing more opportunities to hear from and network with CPOs. New this year, is a speed networking session including seven CPOs. During this rapid-fire session, participants are encouraged to pose their most vexing talent-related questions to the world-class supply management leaders for an opportunity to receive varying responses and perspectives regarding their challenge. In addition, attendees won't want to miss this year's signature session, featuring industry-leading CPO's from ThyseenKrupp NA, DuPont, US Steel, Chevron Corporation, and Procurement and Contracts. For more information on the People Track, visit www.ISM2016.org. With about a month to go until the premier supply management event of the year kicks off, there's still time time to register! To save money on your event registration, contact Source One's Marketing Content Strategist, Carole Boyle at: CBoyle@sourceoneinc.com.